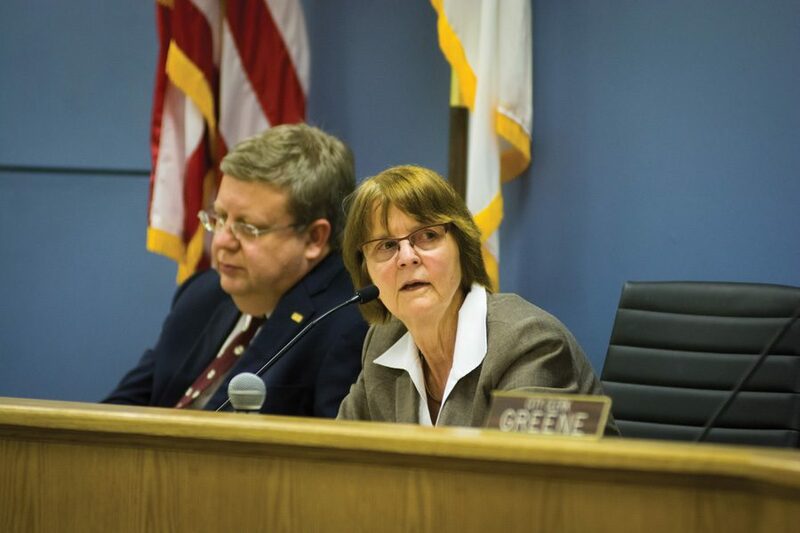 Mayor Elizabeth Tisdahl speaks at a council meeting. Tisdahl delivered her final "State of the City" address as mayor on Friday. Less than one month away from the election that will unseat her as mayor, Elizabeth Tisdahl told community leaders Friday that the city has much more work ahead to keep the city safe and affordable for all. The Evanston Chamber of Commerce hosted its annual “State of the City” luncheon at the Hilton Orrington/Evanston, 1710 Orrington Ave., and Tisdahl addressed the audience of more than 300 at the event for her final time as mayor. Tisdahl announced in July that she would not run for re-election. During her speech, Tisdahl said the city must sustain its focus on keeping Evanston affordable to all citizens. The city has revamped affordable housing units and offered rental assistance to promote affordability, Tisdahl said, but not all city residents’ needs are met. Tisdahl said preserving diversity in Evanston is vital. “The city is doing everything possible to celebrate, retain and increase diversity,” Tisdahl said. Tisdahl also highlighted the recent water agreement the city negotiated with Morton Grove and Niles, as well as continuing negotiations with Skokie and Lincolnwood. The agreement with Morton Grove and Niles will bring $70 million to Evanston over 40 years, Tisdahl said. The mayor said providing jobs to youth remains a priority, highlighting the partnership between the city and Northwestern in which Northwestern’s Facilities Management Department offers year-long apprenticeships. She said the Mayor’s Summer Youth Employment Program employed 750 local youths last year and that the goal for this year is to offer 1,000 jobs. Tisdahl said city officials and the Evanston Police Department are continuing to work on issues related to deescalating police encounters following calls for reform after scrutiny of the contentious arrests of Northwestern graduate student Lawrence Crosby in October 2015 and city clerk candidate Devon Reid in November. EPD officers have removed 79 guns from the street in the past 18 months, Tisdahl said, adding that violent crime in the city has gone down. In addition, EPD and Nichols Middle School are kicking off a mentoring program for middle school boys, she said. Tisdahl expressed support for the upcoming Evanston/Skokie School District 65 property tax referendum that will be placed on the April municipal ballot and would help the district combat a projected $114.4 million deficit by fiscal year 2025. She said the referendum is needed to keep Evanston schools diverse and accessible to all. The city continues to work on economic development, attracting new businesses to the city to replace old ones, Tisdahl said. The commercial vacancy rate at the end of 2016 was 5 percent, the lowest rate in 10 years, she said. Tisdahl ended her address by thanking all who have helped her during her past eight years as mayor.